HORRIFIC and terrifying threats from parents have been revealed by principals across the country who are too scared to speak out. From being threatened with a gun or knife to being beaten with a stick, receiving death threats and being stalked, or spat at by abusive parents - some affected by drugs or alcohol - a number of principals say they fear walking to their car at night. Others have had parents tailgate them or do burnouts in the school car park after a heated conversation at their car door. "A parent said he would go home get his gun, come back and blow my f***ing head away," said one principal who asked not to be named. News.com.au can't reveal who the principals are or which schools they're at because none of them wanted to go on the record. They say they have been advised not to, fearing if they complain publicly they will risk their career or lose their jobs. But their responses have poured in anonymously, from thousands surveyed across the country about workplace wellbeing. Now in its eighth year, The Australian Principal Occupational Health, Safety and Wellbeing Survey has collected data from about 50 per cent of Australia's 10,000 principals from 2011 to 2018. The results of the survey at a glance. 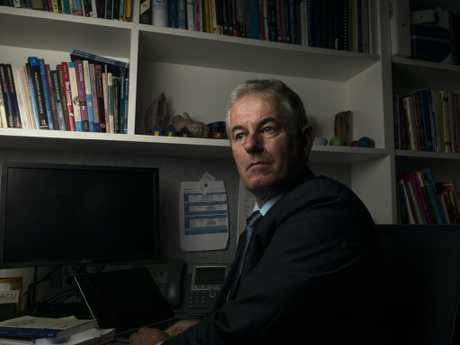 Chief investigator Associate Professor Philip Riley last year revealed to news.com.au preliminary results from his survey indicated a record number of "red flags". Participants get red flagged if they answer questions indicating they are at risk. spent months at a time dreading the walk out to my car at night." • "One student ripped all the cupboard doors off my office cabinets and threw a chair at me." threatened to be killed by gun and knife." One principal has also shared a letter to parents of Australia, provided to news.com.au below. 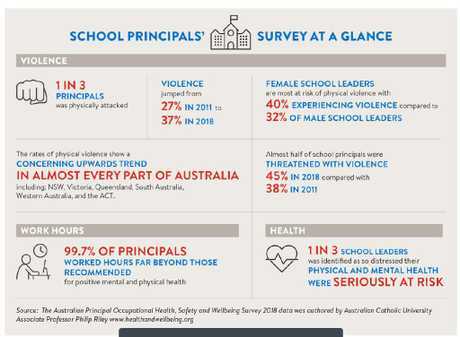 The survey found one in three school principals had been physically attacked in 2018. Close to half were being threatened with violence and the majority worked hours far beyond those recommended for mental and physical health. In a "worrying trend" violent threats were up from 38 per cent in 2011. The survey also found that increasing levels of threats and violence, aggravated by excessive working hours, was leading to serious levels of distress, burnout and depression among school leaders. Associate Professor Philip Riley, from the Australian Catholic University, said "our nation builders are under attack". "Consequently, fewer people are willing to step into the role," he said. 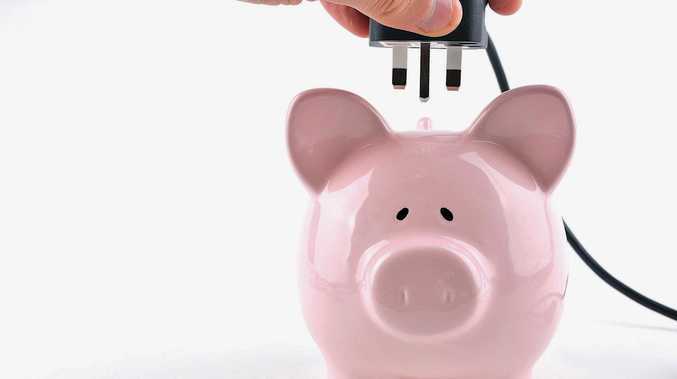 "At a time when 70 per cent of school leaders will reach retirement age within two to three years, we are ignoring a looming national crisis. "The way it is going, it is going to be the number one problem in schools everywhere if we don't do something about it pretty quickly," he added on the Today show this morning. Female school leaders are most at risk of physical violence with 40 per cent experiencing violence compared to 32 per cent of male school leaders. The highest number of threats of violence was found in government primary schools at 49 per cent. "The steadily increasing levels of offensive behaviour in schools of all types is a disgrace and it needs to stop," Associate Professor Philip Riley said. sleeping, 1.3 times negative physical symptoms and 1.3 times more depressive symptoms. "Australia should adopt a whole-of-government approach to education," Prof Riley said. single education budget. The funding agreement should be bipartisan and a transparent mechanism which is simple to understand." • Employers should reduce job demands or increase resources or do both. Since I was very young I wanted to be a teacher, I knew that teachers made a difference in the world and I wanted to give others what my teachers had given to me. After 35 years in education this hasn't changed, and I love coming to school so that I can help your children, all children. However, lately it seems as though you fail to see this. I'm yelled at before you seek to find the truth, I'm threatened at many different levels when things don't go your way, I'm lambasted on Facebook with no right of reply. Even though I have a busy schedule you demand that I see you straight away, or answer your accusatory emails late at night because that is when you are most in need. I have had to hire security agents to sit in on some parent meetings as I'm scared for my own personal safety. I have received death threats. I have been bitten by children, scratched, hit with objects such as cricket bats, scooters, and rocks. I have saved a child from committing suicide. These are just a few examples of the stress I have had to face as a Principal, but my stories are many. You may not know this about your Principal, because we do not make these events public even though many of us experience them every day. Each and every Principal out there is a person, a person with feelings, families and our own trials and tribulations. I have never met a Principal that didn't care deeply about their school or their community, but I have met a number who are simply worn out like I am. I do not have long to go in my career, and at this time I certainly am not promoting the job of Principal to younger teachers. I love my students and my staff, but I hope the wider community wake up and begin to see the role as it truly is and to offer support before those of us that truly care are gone.